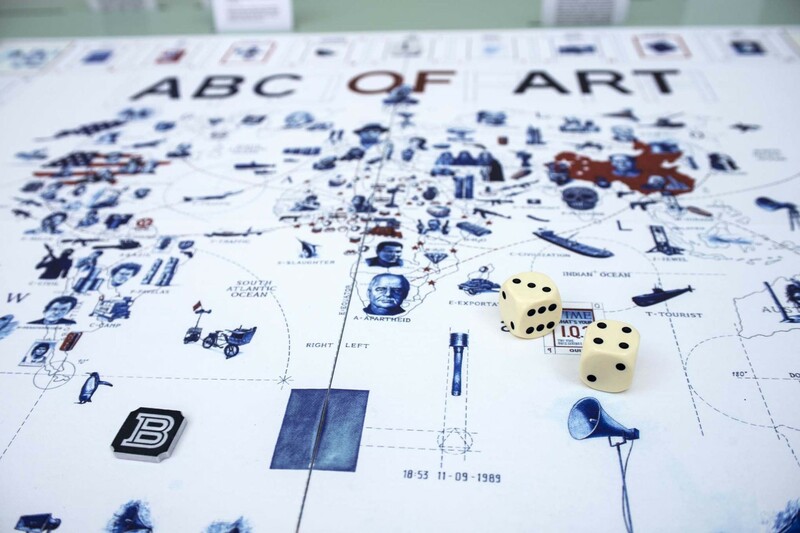 The ABC of Art is a board game for all ages, whose purpose is to provide basic notions on contemporary art. Players challenge each other along a path, carrying out activities or acquiring specific knowledge. 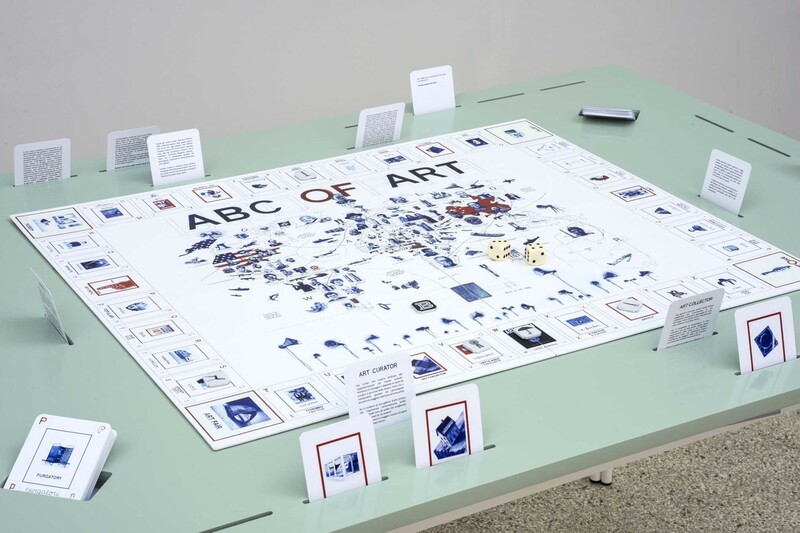 The spaces, organized in ABC form, which is the hallmark of Stampone’s oeuvre, introduce players to a series of representative artists, works, and movements in the history of art and visual culture in the 20th century – from Duchamp to Warhol, from Ai Weiwei to Cattelan, as well as key figures in the art system (critics, curators, art historians, gallery owners, collectors, museum directors, directors of educational departments of museums, journalists, magazine directors, etc. ), who are invited to express a personal point of view on their jobs. This approach makes the contemporary art world, which has always been regarded as hard to understand, more accessible and fun. 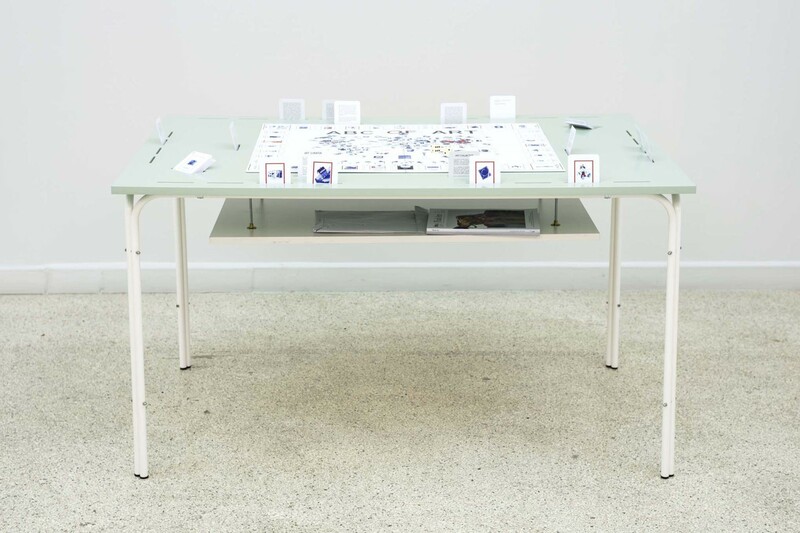 The goal of the game is to win at least 4 of 6 Art System cards – Artist, Art critic, Art curator, Art collector, Press and Public – and acquire the status of contemporary artist. After placing their pawns on the StampOne space, players roll the dices. The player who gets the highest result begins the game. The active player rolls the dices and moves their pawn by a number of spaces equal to the result obtained, in the direction shown by the arrow on the StampOne space. When the pawn stops on an alphabet space, the player has to draw a card from the deck, read its contents and do the activity. Perform an art action, answer a question, produce a critical reflection, suffer a disadvantage or obtain an advantage in the development of the game. 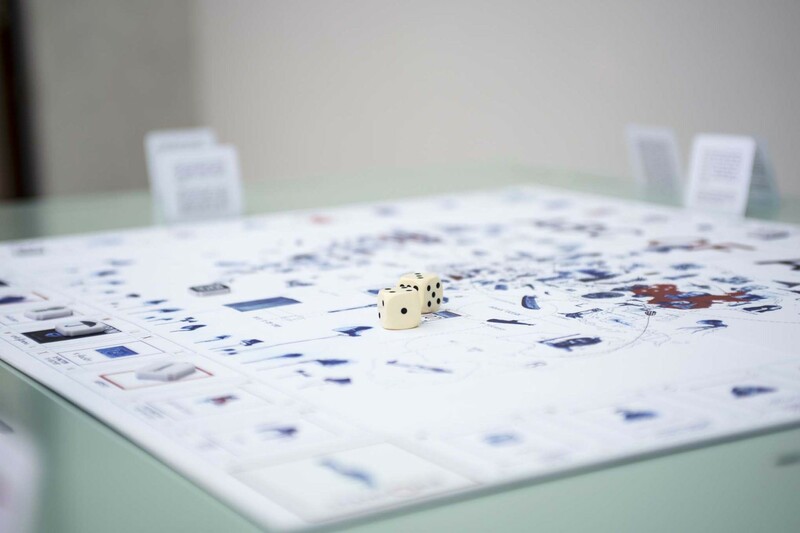 Once they have completed the activity, they have to put the card back under the deck, and pass the dice to the player on their left, who becomes the new active player. Two or more pawns can occupy the same alphabet space at the same time. 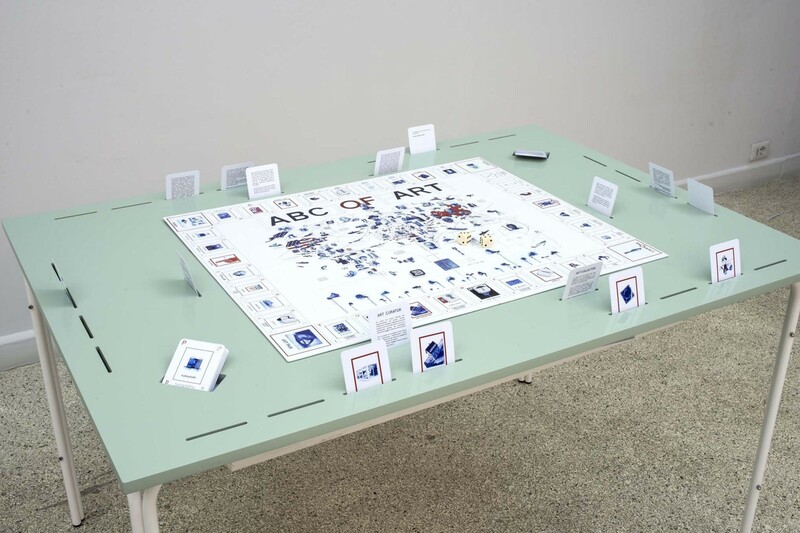 If a pawn happens to stop on an Art System space, the active player (only if they are the first player to occupy the space) is entitled to the corresponding Art System card. If another player has already taken the card, they will have to accept a challenge in order to maintain possession of the card. The challenger will have to draw a challenge card that matches the Art system space, and confront the opponent. The other players act as judges on the result of the challenge, and they have to reach a unanimous verdict. 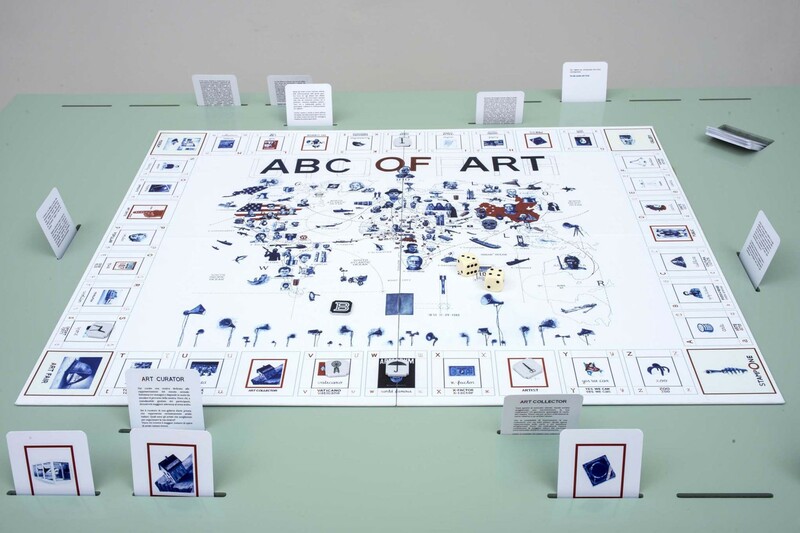 The first player to obtain the 4 Art System cards wins, and the game is over.